Last year’s LA Auto Show saw the world debut of the all-new 2020 Porsche 911 Carrera S and 4S. Fast forward a few months later, and the new Porsche 911 Carrera Cabrio has broken cover at the 2019 Geneva Motor Show. While it's already been revealed online, this is the first time the new convertible 911 has been shown to the public. It retains all of the styling changes applied to the 992-generation 911 Coupe, including a revised front fascia, a variable position rear spoiler, and a fetching full-width lightbar across the rear. The Cabriolet’s folding soft-top roof, which incorporates a rear window, can be raised and lowered in just 12 seconds at speeds of up to 31 mph. Like the S and 4S coupes, the cabrios are powered by a twin-turbocharged 3.0-liter flat-six with 443 hp and 390 lb-ft of torque, paired with a new eight-speed dual-clutch gearbox. A manual transmission will be offered at a later date as a no-cost option. 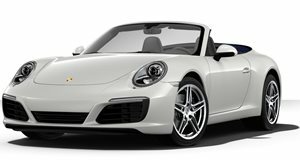 Porsche claims the 911 Carrera S Cabrio will do the 0-60 mph sprint in just 3.7 seconds, while the all-wheel-drive 4S will achieve the same sprint in 3.6 seconds. The rear-wheel S version has a top speed of 190 mph, whereas the 4S maxes out at 188 mph. Inside, the 911 coupe’s cabin design and driver assists have carried over including a 10.9-inch infotainment screen and a Wet Mode to prevent aquaplaning, which uses sensors in the wheel wells to detect water and sends the driver an alert in the gauge cluster, adjusting the stability control and ABS system accordingly. Pricing for the 2020 911 Carrera S Cabriolet starts at $127,350 in the US, while the 4S Cabriolet will set you back at least $134,650. Customer deliveries will start in the summer.